Does Your Burger Joint Make the Grade? Just got finished grading 19 projects, 19 presentations, and the semester-long participation efforts of 79 students. You would think I’d be sick of grading. But no. Because now I get to grade what I really want … the world’s greatest burger joint. OK, the Katy Trail Ice House might not be the best burger joint in the world. But it’s pretty darn good. And I was fortunate enough to be there two days before Thanksgiving, sitting outside on their huge backyard space, eating a delicious burger, drinking a delicious beer, basking in 68-degree sunshine, and watching the beautiful people of Dallas getting their mid-day exercise on the Katy Trail. The view from my table at the Katy Trail Ice House in Dallas. 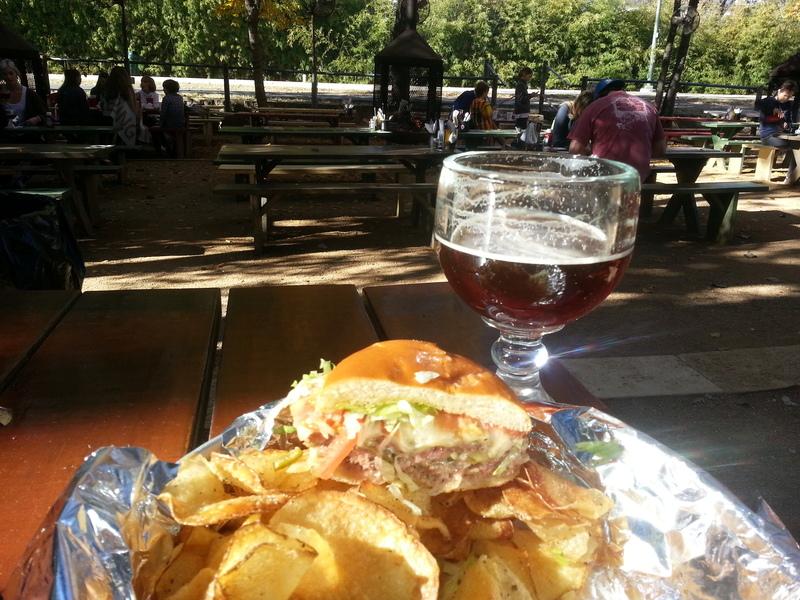 Note the perfectly pink color of the burger, the beautiful amber hue of the 512 Pecan Porter, the sprinkles of glorious sunshine in the backyard, and the very damn wildly popular Katy Trail in the near distance. I have to admit feeling a twinge of nostalgic remorse as I sat there enjoying myself and watching the world go by. Two reasons for this: 1) I helped build the Katy Trail when I was its executive director from 2002-2009; and 2) restaurants with backyards adjacent to the Trail was an idea I’d pushed on every developer during my tenure, but none would ever support my vision. Can you get it cooked to order? – My preference is medium rare. I want quite a bit of pink in the middle of that slab of meat. Most places are either afraid to serve it that way, or have cooks who don’t know how to do anything but burn it to a crisp. The Katy Trail Ice House delivers. Perfectly. Score: 10. Can you get it made to order? – I will never want mustard on my burger, so we’ll always need to 86 that. And if I order the jalapeno burger, it had better not come with sour cream. What Mexican do you know who eats anything with sour cream? Again, the Ice House met my demands. Score: 10. Appearance – You can’t just slap down a burger on a plate and expect people to eat it. Presentation does count for something, even at a burger joint. Katy Trail Ice House puts your food on a small tray covered in aluminum foil, chips on the side. It’s probably not what they teach at Le Cordon Bleu, but it works. Score: 7. Bun quality – Outstanding bun-to-burger ratio here. Not much else to consider in this bun, however. It’s more or less there to keep you from looking like an animal if you were to simply hold charred beef between your fingers. Score: 7. Does it taste good? – Yes, my taste buds were in heaven. It always helps when the burger is cooked to order. But the combination of goodies on top made the whole thing a mouth-watering delight. Score: 10. Are there other items on the menu? – My lunch companion often prefers a chicken something to a burger. The Ice House has a grilled chicken Swiss sandwich, a chicken salad sandwich, and a chicken salad salad. A few other options sprinkle the menu, but this place caters to the burger lover. Score: 7. How’s the beer list? – In a word, excellent. There are about 50 taps with a range of craft and mass-produced beers. Most are Texas beers or others in the region. I was able to get the 512 Pecan Porter, and my IPA-chugging friend got the Lakewood Hopp Trapp. Would love to see the list expanded to great beer-making states like Colorado, Oregon, and Virginia. Score: 9. Is there outside seating? – Holy crap, yes. And the Ice House did it the way I’d recommended to many a developer – throw some gravel on the ground, put out some picnic tables, and serve coffee, water, and beer. In addition to glorious outdoor seating, the Ice House has garage doors that can be opened or closed based on the weather, and lead to the inside seating with a dozen or so TVs filled with every game being played that day. The place even keeps water jugs next to the Trail for the exerciser in need of refreshment. Score: 10. Ambiance – Well, the music is mostly country, which is a demerit in my book. But at least it was classic country and not the pop-country-crap that Nashville has been pushing on us for the last 20 years. The servers are usually quite nice. And the whole thing reeks of casual chic. Excellent place to hang out for a while. Score: 10. Now we add simply it up. And the Katy Trail Ice House burger joint score is … 87. That’s pretty good. But hey, I’m a tough grader. Just ask 79 students. 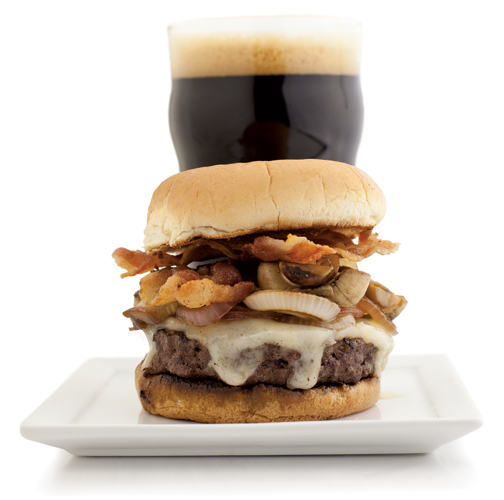 This entry was posted in Burger related and tagged beer, burger, burger place, burger places, burgers, craft beer.